I just finished an invigorating 5 mile walk on a brisk fall day. 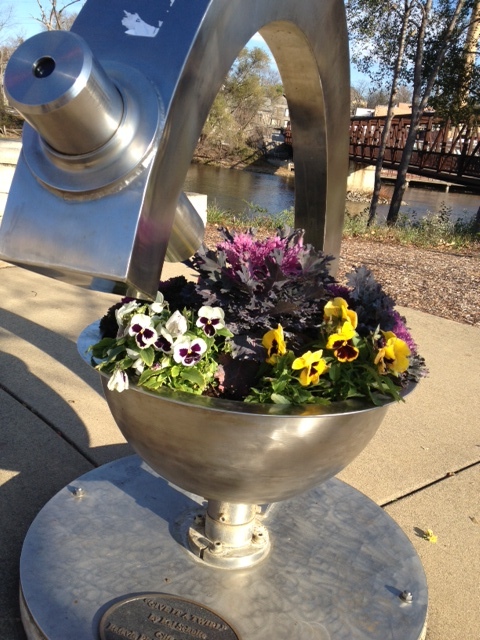 The Fox River Bicycle Trail wound me right by one of my favorite spots, the Batavia Riverwalk. The Taleidscope interactive sculpture featured in the photo was calling me to “Give it a Twirl,” as it is also aptly named. As the color mosaics rotated around in the eyepiece, a wave of gratefulness washed over me. Our community volunteers laid the last bricks on this project over a dozen years ago and today I’m enjoying freshly planted flowers by the Batavia Plain Dirt Gardeners, one of the main caregiver groups of our beloved Riverwalk. Along with the Plain Dirt Gardeners, we have the Batavia Parks Foundation, the Batavia Arts Review Committee and the City of Batavia to look after the Riverwalk. The Batavia Park District has a dedicated and passionate team to keep a watchful eye on the present and plan for the future of our community’s signature park. This was part luck, but mostly the determination of stakeholders who built our beautiful linear park over a span of eight years’ worth of Saturdays, to make sure we take care of it for future generations. While walking along the Riverwalk boardwalk counting planks and sections for an upcoming renovation project, it struck me. What if health care was like this? Specifically, what if cancer aftercare was viewed as a dedicated team approach to creating a plan of physical and emotional wellness, monitoring and patient empowerment? Like our Riverwalk, “it” would need maintenance and caregivers intervention from time to time, but also like our Riverwalk, an aftercare plan would be the road map needed by cancer patients to create a path ahead. Instead of being left to fall off the cliff after our last treatment, we would move seamlessly from treatment to a purposeful fork in the road mapped out for us thoughtfully. Friends and family are wanting us to celebrate the conclusion of our treatment, expecting us to just pick up our lives right where we left off before the “c” word entered our lives. If you have had cancer, you know first hand, this is not how it is. Fear and anxiety of recurrence, loneliness and isolation of feeling different, self-image and self-esteem issues and a world that looks very different then “before” suddenly envelope you after treatment is finished. All these emotions need a plan and time to be sorted out and dealt with; the follow-up appointments of medical caregivers needs to be orchestrated into a purposeful plan that not only details what the treatment was, but detail future wellness caring and planning, diet and exercise and counseling. What does a good after care plan look like? One example is from Journey Forward, which has online tools to help me get started, however the download is for a PC and I’m on a mac, so I’m not sure how useful most of it will be unless I can find a PC to take a look. Some progressive cancer hospitals that use an integrative team approach create plans which accompany cancer patients out the door after their final treatment. I’m sure that cancer care centers are looking at this and how they can help survivors create their personalized plan, so I’ll keep a lookout for programs near me. Recently the news mentioned that 80% of cancer patients/survivors don’t have an aftercare program. Realizing I am in that vast majority, I ventured to our library and checked out as many books as I could carry without triggering lymphedema (breast cancer humor relief). Currently I am vigorously reading After Breast Cancer by Hester Hill Schnipper, which is resonating with me. The pile of five other books awaiting perusal have given me purpose on this new journey of aftercare and a deadline before they are due back at the library. So, off I go, to find or create my best aftercare program. I’ll share what I find on my quest so maybe you can add it to your backpack too. Because we are on this journey together and there is power in sharing. If you have found or used a survivorship plan or resource, please comment and help build our collective knowledge. Forward!